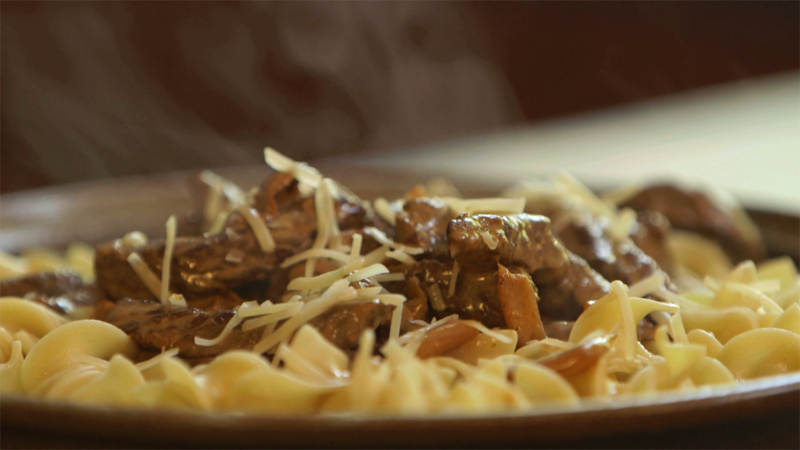 “Muntjac Stroganoff” might sound like a Bond villain, but in reality it is one tasty meal! With thin tender strips of muntjac with chantrelles this is a dish to write home about! • Bring water to boil in a pot then add the noodles & cook according to directions. • Cut meat into thin strips across the grain as you would for a stir fry & set aside. • Meanwhile, melt the butter in a heated skillet & add the deer strips, onion & garlic, stirring until meat & onions are slightly browned. • Stir in mushroom strips until they also begin to brown then pour in wine & allow to cook for 5 mins. • Stir in all remaining ingredients for the sauce, tasting to adjust for flavor, then allow to cook over med/low heat until meat is tender(10 mins). If sauce gets too thick add milk or hot water from the noodles to reach desired consistency. • Drain the noodles, stir in a bit of olive oil, set noodles in pasta bowl then pour the stroganoff overtop. • Sprinkle the cheese overtop & serve immediately. Serves 3 but if one of them are still hungry they can eat something else.